It's been a while since I put together an eBay edit purely because I don't feel like I need to bombard you will more budget brushes and nail polish bargains. 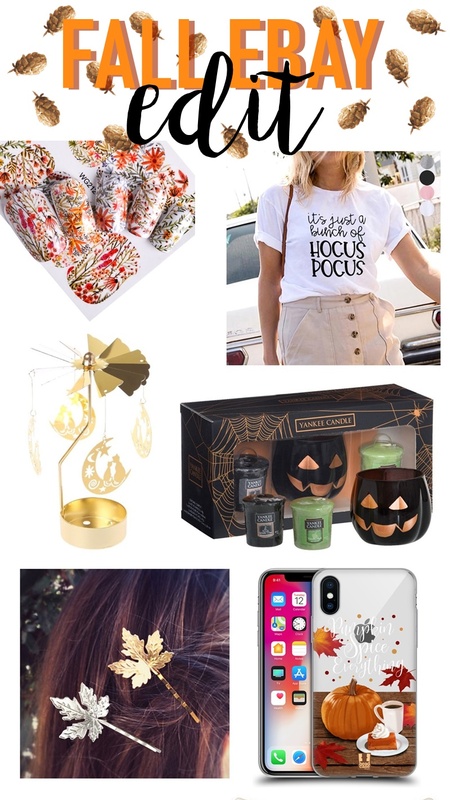 However with Autumn here I couldn't resist having a look on my favourite budget website for some autumnal themed pieces and if I do say so myself I think I did pretty well, I mean I found a chic Hocus Pocus tee! While there are a ton of autumnal nail polish shades on the market a little nail art is sometimes nice. If you aren't familiar with nail water decals then you need to be as they are one of the easier and long lasting ways of doing nail art without the mess or need for a steady hand. Simply cut out your nail decals in a rough nail shape, soak in water, slide off the backing and then gently place onto the nail with a pair of tweezers. As these are so delicate you do have to be careful however once they are on and sealed in with a clear top coat there's absolutely no peeling as there's no thickness to them! I absolutely love the design of these as they are definitely autumnal but still fresh looking. Also, it helps they're a total bargain! Okay, so I've very pleased with this find. I mean it's the cutest Hocus Pocus themed tee I've ever come across! If you are a fan of the movie or simply love Halloween then you may want to pick this one up. It comes in white, black, grey and yellow and the sizing is varied but I would definitely size up, maybe even more as China sizing is always on the small side! If you love cosy candles burning come autumn then you simply need a decorative carousel tea light holder in your life that will dance pretty shadows up the wall as it magically spins around. Basically, they take candle burning to another level! Plus you can always pop an autumnal scented Yankee Candle tea light in one for extra autumn comfort. While there are lots of different designs to this listing 'Cat on the Moon' has Halloween vibes to it... although I am eyeing up the dainty snowflake design for Christmas! They also make a lovely gift! Yankee Candle and Halloween go hand in hand. If you want a Halloween candle then YC have you covered. 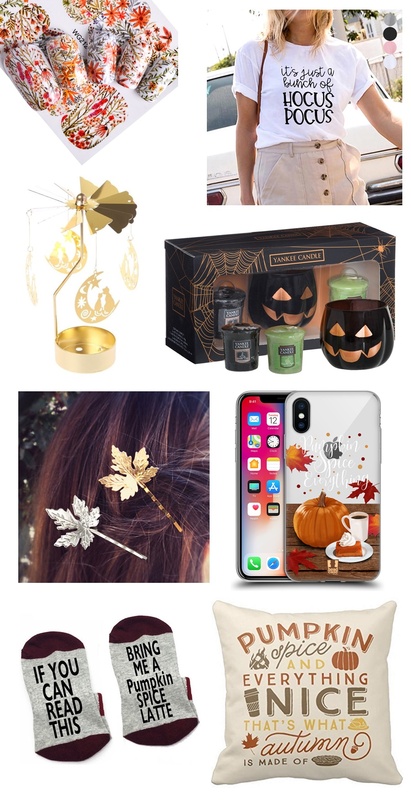 Which is why I had to include this amazing Halloween gift set that includes a glowing pumpkin glass votive holder along with Witches Brew and Forbidden Apple votive candles. As Halloween is pretty short lived this is a perfect way to add some adult Halloween decor to your home and you can even bring out the Yankee Candle votive holder for years to come. Next up, a cute hair accessory that is such a bargain I couldn't not include it! I've featured a few cute hair slides before (you can find my favourite bee ones here) but these maple leaf hair pins are totally new to me. These would look perfect to pin up dutch brains or even in a messy bun. Cute and such a bargain! If like me you love Autumn so much that you want to show the world your love for the season then you need an autumn-themed phone case. There sadly aren't that many around, however 'Pumpkin Spice Everything' is a mantra I can go with and the design is pretty cute. I also really like this cute Halloween pumpkin cover for only £1.70! Keeping with a pumpkin spice them, because why not, I have probably the most ridiculous find for you here. Yes, these socks are totally pointless but fun! There's an entire range of the 'If You Can Read This..' socks in the same listing so you aren't just limited to these ones. I won't be picking them up because I'm not that pumpkin spice latte obsessed but if you are then.... why not! Okay, maybe I am slightly pumpkin spice obsessed. But I can never resist inexpensive cushion covers from eBay. They are my weakness along with cheap makeup brushes, nail polish and dainty necklaces (see below). Perfect to update a sofa or bed this is just a lovely slogan autumnal cushion cover that can easily slip over a cushion you already have. No more pumpkin spice themed items for the rest of this eBay edit... I promise! A lot of things on eBay are my 'thing' to buy. Especially cute dainty necklaces. One of my favourite eBay purchases of last year was this Alex Monroe style Bee necklace, which for the price is just amazing as I still wear it and it's not tarnished in the slightest. So of course when I spotted this cute pine cone necklace I had to snap it up. Available in both antique brass and silver I went for silver and can say it really is a lovely autumn accessory. I seriously wouldn't be put off by the super cheap price tag! Lastly, it wouldn't be an autumn eBay edit if I didn't mention some cute fairy lights! Along with candles, fairy lights create a cosy atmosphere and while you can pick them up anywhere I love heading to eBay to find something a bit different and on a budget. Perfect for around a fire place or wrapped around a staircase these autumn leaf fairy lights come battery operated and a 1.65m length. I'm very tempted to pick these up! Let me know you favourite autumn bargains from this little lot!